NASA astronauts Anne McClain and Christina Koch will make history on 29 March by becoming the first all-women team to perform a spacewalk, which they’ll do outside the International Space Station. On 25 July 1984, Soviet cosmonaut Svetlana Savitskaya became the first woman to participate in a spacewalk. Now, some 35 years later, history is set to be made again. Later this month, NASA astronauts Anne McClain and Christina Koch will become the first all-female spacewalking team, according to CNN’s Gianluca Mezzofiore, who confirmed the news with NASA. Kristen Faccio from the Canadian Space Agency will provide the necessary ground support, which she’ll do from NASA’s Johnson Space Center in Houston. Judging by her tweets, Faccio is justifiably pumped. Of the roughly 500 people who have been to space, less than 11 per cent have been women. All spacewalks to date have either involved teams consisting exclusively of men or teams involving both men and women, reports the Guardian. To say an all-female spacewalking excursion is long overdue would be a gross understatement. NASA television coverage of the 29 March spacewalk is scheduled to start at 11:30 a.m. GMT, and it’s expected to last for about 7 hours. The purpose of the spacewalk is to replace batteries that were installed last summer, per the Guardian. For McClain and Koch, both of whom were selected to be astronauts in 2013, it’ll be their first spacewalk. McClain is currently aboard the ISS as a member of the Expedition 58 crew, which arrived back in December. 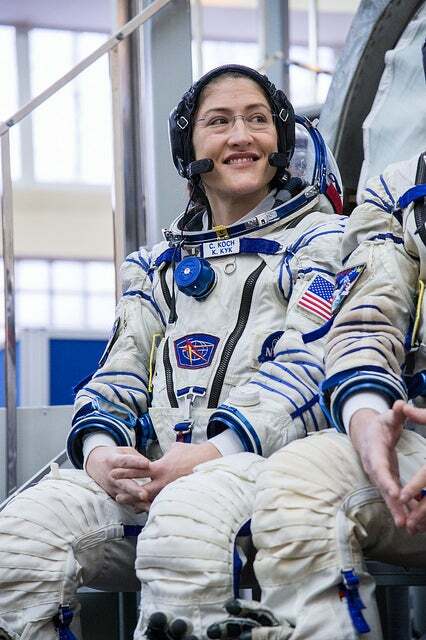 This is her first stint in space. Koch is scheduled to serve as flight engineer for the subsequent Expedition 59 and 60, the first of which is scheduled to launch on 14 March. Koch will be joined by NASA astronaut Nick Hague and Russian cosmonaut Alexey Ovchinin.